Meet and Assist upon arrival with our English Speaking airport representative, guest will be transfer to the hotel. Check in the hotel. Guest will pick up from the hotel and start the tour by visiting Rustaq. It was once a capital of Oman during the era of Imam Nasir bin Murshid al Ya'arubi. Rustaq is an area of healing warm springs, the most notable being Ain al Kasafa. 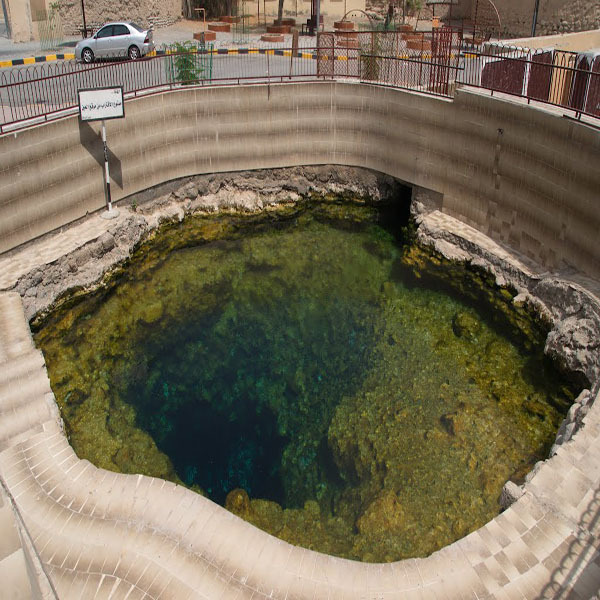 Al Kasafa is the most famous hot spring in Oman located in Rustaq region which believed that it can cure some skin diseases. Many tourists come to see it and it surprise most of them. The government is now building a health club which contains many services for those who want to enjoy the hot water like: stream pools, swimming pools and health center for bone problems and other related issues. We continue our drive to visit Nakhal, where we will visit the 400 years old fortress of Nakhl located on top of a massive hill in the middle of a creek bed which is one big sea of green palm trees. This fort once served the Imams of Bani Kharous and the Ya’arubah dynasty. After recent restoration work carried out on the fort, it is refurbished with traditional furniture, handicrafts and historic relics. The ceilings, the doors and windows are decorated with beautiful carvings. The view from the roof-top is very impressive and offers a panoramic view of the surrounding landscape. Our last stop will be in Wakan Village, This village sits at 2,000 meters above sea level in Wadi Mastal in Wilayt Nakhal, located in Al Batinah South Governorate. 150 kilometres separate this village from Muscat. The road leading to the village passes through a number of valleys where the villages can only be reached by a four-wheel-drive vehicle. This region enjoys moderate temperatures in summer and low temperatures in winter. Visitors will observe many agricultural terraces supporting fruit trees, including grapes, pomegranates and apricots, as well as some legumes. At the village entrance is Information and Visitors’ Centre. Breakfast at the hotel and check out. Guest will pick up from the hotel and will through Wadi Bani Auf. It is an ancient wadi offering breathtaking vistas along its 26-kilometre trail. A little gap in the mountains, barely discernible from the main road, reveals the entrance to the wadi, which cuts a swathe deep into the mountainous terrain. Atop its craggy summit, a crumbling watchtower, picturesque in ruin, marks the entrance to the wadi. A short distance ahead, a splash of vivid green brings you to a delightful oasis village called Al Far'a. Nourished by an underground falaj, date palms and an assortment of other trees, grow rich and thick. It makes an enchanting sight amid the barrenness of the wadi. Vegetation is verdant for several kilometers along one side of the wadi, following the course of a perennially flowing falaj. Tucked away in the cool confines of this growth are the houses of local residents, shielded from the glare of the sun. On higher elevations along the wadi here, are the remains of stone houses, cobbled together with stones found on the wadi bed. We continue our drive to visit Al Hamra. It is a 400-year-old town in the region Ad Dakhiliyah, in northeastern Oman. 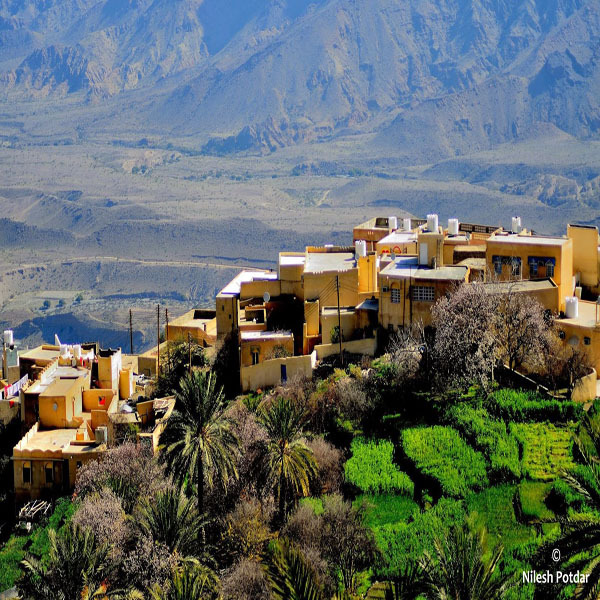 It is home to the mountainside village of Misfat Al Abryeen. Ghul lies to the west of the town. Al Hamra is also known as Hamra Al Abryeen with reference to the Al Abri tribe who live there. Some of the oldest preserved houses in Oman can be found in Al Hamra, a town built on a tilted rock slab. Many of the houses have two stories, with ceilings made of palm beams and fronds topped by mud and straw. Guest will pick up from the hotel and start their tour by visiting Nizwa, tourist site par excellence and the first capital of the Sultanate of Oman in the sixth and seventh centuries. Nizwa has managed to retain its charm through the centuries with its strong and its guard tower that protects the city against invaders. This is the land of Imam Ibn Al Julanda first democratically appointed imam in the seventh century. Visit the fort surrounded by palm trees. Our last stop will be at Masirah Island; 20 Kms off the South East of Oman lies the largest island of Oman, Masirah Island. History tells us that Alexander the Great was looking for a trading port in the Gulf which could also double up as a base for his troops. He chose the far flung Masirah Island naming it Serepsis. The island is also known for its coral reef barrier. 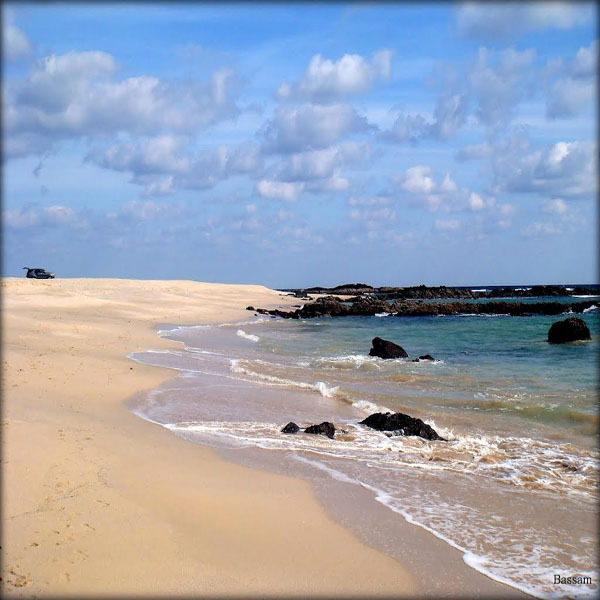 The entire island is dotted with hills and sandy beaches, most of which are uninhabited and is 80kms long and 18 kms wide. Access to the island is mostly by the sea and the boat ride along with sheep and goats sometimes finds you in good company. The isolated beaches serve as turtle breeding and nesting grounds, and are thus havens for conservationist. Places where mountains meet the sea or where a headland juts into the waters, normally makes for an ideal playground for dolphins and whales. Look out for these lovable creatures in the waters around Masirah Island. Guest will pick up from the hotel and take the ferry back to Shannah Port. From the port we will start the tour by visiting Al Khalouf Beach. Al Khalouf Beach is far enough south of Muscat to be off the tourist trail. Soaring sand dunes provide the backdrop, local fishermen pitch up along the shore and the beach’s vibrant bird population means eagles will soar above whilst flamingos balance precariously alongside you. Guest will pick up from the hotel and start the tour by visiting Jaalan Bani Bu Ali, it is one of the largest states of the province of South – East area and is located in the South-Eastern of the Sultanate of Oman. (Photo Stop at Al Hamoda Mosque) Build in a beautifully simplistic style, the mosque’s 52 domes have hidden provision for ventilation. The domes, along with palm trees in the courtyard, contrast vividly with the blue of the sky. Falaj Al Dhahir bubbles through the courtyard where it is used for pre-prayer ablution and makes the areas cool and restful. Guest will pick - up from the hotel for turtle watching at Ras Al Jinz to have a glimpse of giant green turtles. Note camera’s is not allowed. Guest will pick up from the hotel and start drive to costal roadd to visit Sur; it is an ideal location in the northeast province of Sharquia and is a seafaring town, a fishing village and a trading port all in one. The highlight of the town is the dhow builder’s yard on the coast just beyond the town. Sur started trading activities with the African coast as early as the 16th century A.D. a drive through its labyrinthine streets reveals many fine old houses with caved doors, arabesque windows and other intricate details. Guest will pick up from the hotel and start their Muscat City Tour by visiting Sultan Qaboos Grand Mosque (Masjid), one of the most beautiful architectural piece of work. The mosque was built over a period of 6 years from 1995 to 2001. The main chandelier is made of pure Swarovski crystal and the carpet adorning the large prayer hall was woven by experts, made out of pure Persian silk. The mosque (Masjid) exterior is constructed with quality Rajasthani sandstone andthe main halls as well as the small prayer rooms are adorned with the finest Italian Marble. The Mosque (Masjid) is surrounded by 5 minarets, each of which symbolizes the holy five vows taken by every devout Muslim to reinforce his faith in the Almighty. We will proceed to Old Muscat. We then drive via the waterfront corniche and visit the MuttrahSouq, one of the most popular souqs in the Middle East. Take a walk in its labyrinthine alleyways beckoning with a myriad of merchandise, from imported fabrics to exotic Oriental spices, perfumes and richly handcrafted Artifacts. A visit to this frenetic, pulsating hub of Muscat’s old quarter makes for a delightful experience. Breakfast at the hotel and checkout from the hotel.